When Daniel and Ilana got married in Guatemala City earlier this year, the couple wanted to create a modern day time capsule that would allow them to relive the day. "As we started to plan the wedding, it became clear we needed something that could truly capture everything about the day, in a way we could enjoy many times over," said Daniel, who declined to share the couple's last name. In fact, the newlyweds have re-experienced their wedding several times by watching it back in virtual reality. The company hired Aventura, Florida-based startup YouVisit to capture 360-degree footage and turn it into something that virtually transports them back to that day. "My wife, who has watched the video many times already, cries every time," Daniel said. "No matter how much we see it, there's always something we hadn't noticed before. These are things that would have gone unnoticed because we were so wrapped up in the moment, but it feels like a whole new day every time we step into the virtual environment." A small team from the professional VR filming service attended the wedding and set up cameras at specific spots throughout the grounds. YouVisit then compiled the footage and released it online, so the couple could share it with anyone with access to a desktop computer, mobile phone or VR headset. 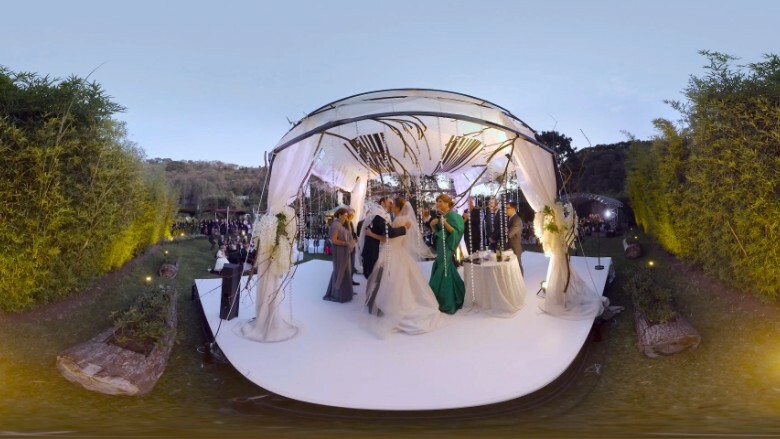 While capturing a wedding in virtual reality may not be at the top of a couple's priority list, especially when it comes to limited budgets, Daniel said remembering the day was more important than splurging on other areas.